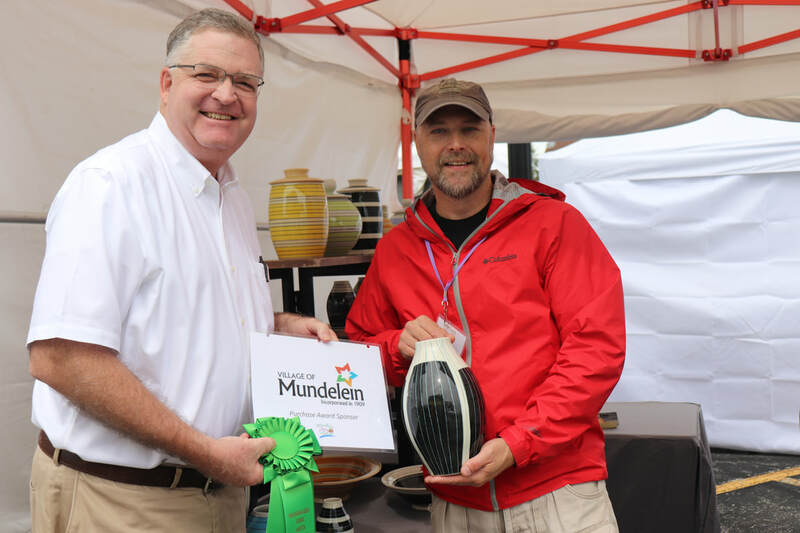 The 9th Annual Mundelein Arts Festival, a juried Fine Arts and Crafts Festival, will be held on Saturday and Sunday, September 7-8, 2019 in Kracklauer Park, 100 N. Seymour Ave., Mundelein IL. Creators of original art and fine crafts are invited to apply. We are seeking approximately 45 fine artists and craftspeople for our juried show. Mundelein, Illinois, a town of 31,000 people, is located 45 minutes northwest of downtown Chicago. This is more than just an arts festival! Not only will you have the opportunity to sell your art and bring awareness of your talents to the greater public, but also, by participating, you will; expand awareness of the arts; have an opportunity to meet our high school artists and share sage advice; and be the means of providing scholarships to high school students that are pursuing the arts in college. By helping our youth pursue the arts we keep the arts strong and alive for the future! All entries to the show will be juried. All art work shown in festival must match design and execution quality represented in pictures. Commission-free sales. Artists are responsible for providing their own tents, display tables, materials, etc. All tents must be white and properly weighted in place. All spaces are assigned. Each standard display space is 11 x 12 to fit a 10x10 tent. Special needs should be noted on the application form. Art Fest program brochure listing artists, media and artist location will be provided. Complimentary morning coffee and breakfast item will be provided to exhibitors, by McDonald's, located next to the art fair. Vouchers are included in the welcome packet. This year we are using Zapplication. If you have any questions about Zapp, please contact Christa Lawrence at christa.lawrence@mac.com for assistance. Application will open after January 2019. Early Bird Deadline: Postmarked on or before April 15. Early applicants save $20 on the booth fee. Upon acceptance, Early Bird applicants will receive a coupon code via email to reflect the savings. *Late applications may be accepted based on space availability. Email or call below to inquire. Mundelein Mayor Steve Lenz purchasing a photograph from artist Neil Estrick. Major newspaper advertising and publicity is planned as well as TV advertising, eblast and social media and outdoor signage. Live musical entertainment will be scheduled throughout the two day event. Food will be available from festival food vendors as well as area restaurants.